Watch students' video sharing of their findings of Snapple "Real Fact" #17 via This Slideshow which documents their journeys in verifying some of the "Real Fact"s printed on the inside of the Snapple caps, utilizing the T.I.G.E.R. research process. 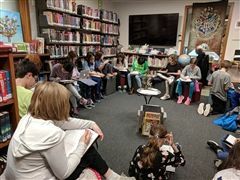 After winter break, the Middle School Library welcomes 4th graders back to school with a cozy activity: sharing our favorite recent reads. This story we made up in Library Class (in ROUNDS format,) is in preparation of a unit on Searching Strategies and Information Providers.